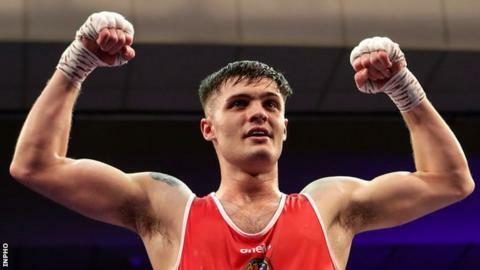 Olympic hopefuls James McGivern and Michaela Walsh were among the Ulster winners at the Irish National Elite finals at the National Stadium, Dublin. Belfast boxer McGivern beat 2018 60kg champion George Bates on a 3-2 split decision in the 63kg decider. Walsh retained her 57kg belt with a unanimous decision over Dearbhla Duffy in a repeat of last year's final. Antrim's Chloe Fleck beat Donna Barr on a 3-1 verdict at 48kg and Carly McNaul beat Niamh Early in the 51kg division. Errigal's Dominic Bradley lost out on a unanimous decision to David Oliver Joyce at 60kg. St George's southpaw McGivern, a 2018 Commonwealth Games bronze medallist, and flyweight McNaul of the Holy Family Golden Gloves Club were two of four fighters on the night to win on 3-2 splits. Two-time Commonwealth silver-medallist Walsh has high hopes of qualifying for the Tokyo 2020 Olympic Games and the Monkstown fighter took a dominant victory over her Crumlin opponent. Canal boxer Fleck forced Illies' Barr into two standing counts in the third round en route to her triumph in a repeat of the Ulster final which Fleck won on a 3-2 split.